As we approach the end of Autumn 2017, the Catch Up® team are looking forward to a well-earned rest after yet another very busy term! We have delivered more than 80 ‘Delivering Catch Up®’ training courses, welcoming over 900 attendees to the Catch Up Community! 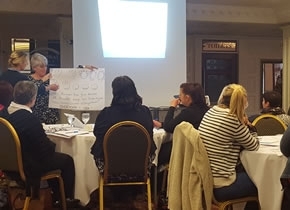 In addition to this, we have been really pleased to deliver our additional training sessions including ‘Review and Refresh’, ‘In-depth workshops’ and the Coordinator network meetings! Our Accredited Trainers once again visited some of our fantastic Regional Training Centres, and found a warm welcome at a number of schools and other venues across the UK! Courses took place in London, Havering, Liverpool, Plymouth, Exeter, Bournemouth, Bristol, Essex, Durham, Hull, South Wales, Milton Keynes, Birmingham, Merseyside, Suffolk, Oxfordshire, Lincolnshire, Manchester, Leeds, Surrey, Nottinghamshire, Powys, Gateshead, Swansea, Norfolk, North Wales, Staffordshire, Cumbria, Dublin, Belfast and many parts of Scotland! We haven’t stopped there this term! Our Catch Up® team have also been busy delivering training in Australia as well! Phew – we definitely need to put the kettle on! These responses are echoed through the feedback we receive directly from other course attendees as well. Across all of our courses, the average trainee response to ‘How would you rate the training course overall?’ was 4.6 (with 1 being ‘poor’ and 5 being ‘excellent’)! Our trainers are now getting ready for their festive break, but are very much looking forward to meeting more of you in the Spring term!